The Lakers' formidable duo of Pau Gasol and Kobe Bryant aim for a three-peat this season. The Los Angeles Lakers recently started training camp at their team facility in El Segundo, Calif., without little fanfare. There were no one-hour ESPN specials to announce their existence and there were no pyrotechnics to introduce Kobe Bryant, Phil Jackson and Pau Gasol – the real Three Kings of the NBA. Unlike their neighbors from South Beach who boasted that they are going to set the league on fire this season, it’s business as usual for the Lakers – and that’s how they like it in Title Town. The two-time defending NBA champions don’t need to flex their muscles or brag to everyone how great they are. Those 10 gold ball trophies sitting in their practice facility speak for themselves. The NBA season ended with the Lakers on top and it’s only fitting to start the season talking about the Lakers first. The Lakers return the nucleus of their 2010 championship squad. They still have arguably the best player on the planet in Bryant, arguably the best big man in the NBA in Gasol, arguably the best defender in the NBA in Ron Artest and arguably the best sixth man in the league in Lamar Odom. And, oh by the way, they have the greatest coach in NBA history in the Zen Master. No argument there. Add free agents Matt Barnes and Steve Blake to an already formidable roster and you have easily the best and most complete team in the Association. There should be no argument there. All the buzz during offseason was how good or great the Miami Heat will be this season with the addition of LeBron James and Chris Bosh to go with Dwyane Wade. Even some Las Vegas oddsmakers are picking the Heat as the favorite to win it all this season. Last time I checked, two of those three guys haven’t won an NBA title and Wade won his four years ago. Adam Morrison has more championship rings than the much-hyped Heat trio! Based on past history, championships are won inside and that’s the one big advantage the Lakers have over the Heat is their size, strength and length. Teams with the best interior offense and interior defense are the ones collecting rings. It’s a proven formula. Bill Russell was the anchor of the Celtics dynasty, Kareem Abdul-Jabbar was the anchor of the Showtime Lakers, Hakeem Olajuwon was the anchor of the Rockets, Tim Duncan was the anchor of the Spurs, and Shaquille O’Neal was the anchor of the Lakers’ three-peat. As good as Kobe is, he has never won a championship without a dominant big man. He had Shaq earlier in the decade and now he has Gasol and Andrew Bynum (aka The Hollywood Hills) at the end of the decade. Add Odom to the mix and Bryant is blessed with three freakishly good low-post players who can score, rebound and defend. 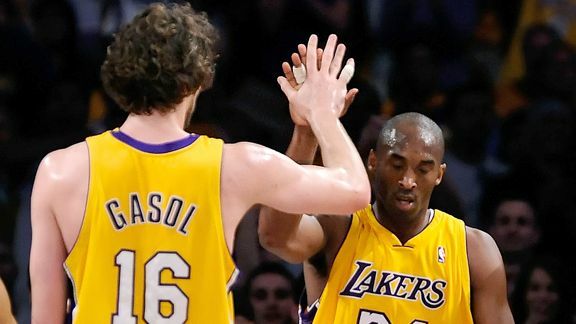 Since acquiring Gasol, the Lakers have won more than 80% of their regular-season games and have been to the NBA Finals three consecutive seasons – winning the last two. His performance in Game 7 of the NBA Finals against the Celtics was legendary, and he could have easily been named the Finals MVP. Gasol is going to have to carry the load for the first couple of months because his fellow big man, Bynum, will be sidelined recovering from knee surgery due to a torn meniscus. There were reports that Bynum was too casual about getting his knee fixed during the offseason, but Lakers General Manager Mitch Kupchak said on Monday that the Lakers were not “blindsided” by the late surgery and the Lakers were well aware that Bynum could miss the first month of the season. Bynum is not the only Laker starter sitting out training camp. Bryant had offseason knee surgery on his right knee, and as a precaution he is easing his way back into form. When Bryant was asked what the time table is for his return, he said: “When [the knee] is ready, I’ll play.” Bryant said he rested all summer and there shouldn’t be any worries regarding his health. Translation: He’ll be starting on opening night.